Description: One bridge you dont see often is this one over Baron Creek in Baron Okla, perhaps because the sun angle us not good for a shot from the US 59 bridge til very late in the day, and a morning shot is a walk in. Here we see a southbound approaching the truss span as it crosses a mostly empty creek bed. Description: Kansas City Southern stack train heading north through Granite City, IL on a beautiful early October afternoon. The new SD70ACe locomotive really looks sharp!! Description: KCS 4030 in Retro Belle paint leads a rock train through the Ouchita Mountains. My first train with a Retro Belle in the lead!! 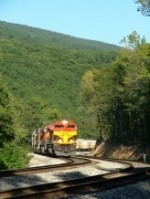 Description: Rock train reaches the top of Rich Mountain on KCS's Shreveport Sub. Description: Rock train rolls down Rich Mountain. Description: Herzog Rock train rolls down Rich Mountain behind a Retro Belle. Description: Northbound rock train rolls through the "S" curves in Page. Description: KCS rock train rolls through the Ouchita Mountains behind a Retro Belle. 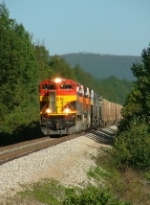 Description: Southbound coal train crosses into Arkansas from Oklahoma. 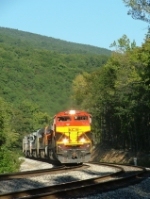 Description: Southbound coal train battles Rich Mountain on KCS's Shreveport Sub. Description: Southbound coal train heads up Rich Mountain on KCS's Shreveport Sub. w/ a colorful consist. Description: Coal train works its way up Rich Mountain on KCS's Shreveport Sub. Description: Coal train rolls down Rich Mountain on KCS's Shreveport Sub. Description: One of the few double sets of Retro Belles seen over the weekend. Description: A NB M train with a large number of lite engines picked up at Rich Mountain. Description: H-KCSH stops waiting for its conductor. 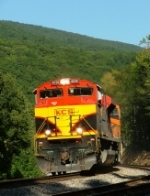 Description: Close up of KCS SD70ACe 4030. Description: Southbound grain train waits for room at the fueling racks in Heavener at CP South Howe. Description: One of the few remaining KCS white ghost's leads a southbound toward Heavener. 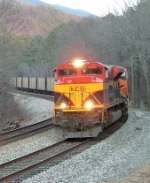 Description: KCS 651 leads a southbound through CP South Howe as it nears Heavener. Description: Northbound coal empty waits in the hole at Page for a soubound grain train. Description: Coal train rolls into Page siding on the Shreveport Sub. 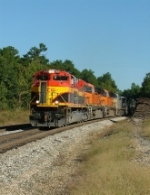 Description: Coal train and grain train meet in Page Oklahoma on the Shreveport Sub. Description: KCS 4030 leads coal empties down Rich Mountain. Description: Coal train drifts down Rich Mountain and into the siding in Page Oklahoma. Description: A good photo location is alongside Ark 59, just north of where it passes under Ark 102. Theres a nice long S curve there thats reasonably open, and makes a good morning shot. I was able to catch this southbound grain train a bit later in the day, the light working due to the overcast. The snow helped, and this shot made a good Christmas card. Description: A 75 car southbound grain train behind a pair of Belles rolls around the curve at the north end of Stilwell in a rare wintry scene. Description: We were out on this snowy day chasing-which we did in NY all the time, since it snowed A LOT there, so no big deal to go out in the little bit of snow we get in Arkansas. One of the prizes that day was this southbound we caught near Sulphur Springs behind a pair of new Belles, which was a big deal at the time. Description: Southbound grain train poses by the Watts yard office before heading south again. Description: A southbound grain train rolls along Butler Creek in a snowy wonderland not typical of Arkansas. Description: Heading downriver on the New Orlean Public Belt. Description: KCS 4030 north tied down at Wickes waiting for a work block to end.